Russia's Jehovah's Witnesses Fight 'Extremist' Label, Possible Ban : Parallels Under Russia's anti-extremism law, Jehovah's Witnesses, who number fewer than 200,000, could be barred from practicing their religion in Russia. Their website and some publications are already banned. 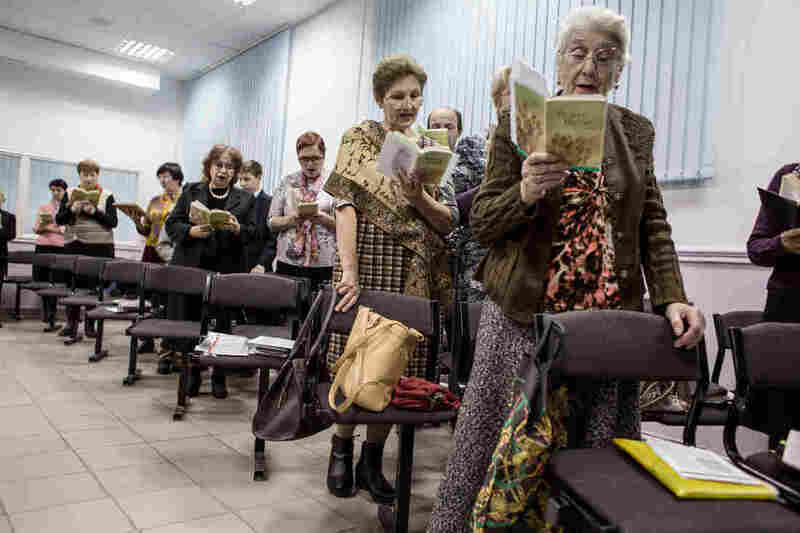 Jehovah's Witnesses sing songs during a meeting in Rostov-on-Don, Russia, in November 2015. The country's top prosecutor is threatening a nationwide ban for alleged "extremism." The Jehovah's Witnesses aren't alone. Other denominations, such as the Mormons, are also under pressure. Jehovah's Witness leaders say a nationwide ban would affect some 175,000 church members but wouldn't stop their activities. One important activity for members is Bible study on weekday evenings. A couple of hundred people gathered at a Kingdom Hall in St. Petersburg on a recent evening to sing and discuss the meaning of Bible stories. They also talked about how to tell other people about their vision of Christianity and their version of the Bible. The Jehovah's Witnesses are well-known for preaching door to door and offering tracts such as "The Watchtower," and they do that in Russia too. They have been active in Russia since at least 1891, when a man was sent to Siberia for preaching the doctrine, says spokesman Robert Zick at the church's headquarters in Brooklyn, N.Y. But the Jehovah's Witnesses were not officially registered in Russia until a century later. One thing that's very much on church members' minds now is the prospect that their preaching could be banned. In March, the group received a warning from the Russian general prosecutor's office, saying it had two months to stop all activities that are deemed to be "extremist." "The main problem that we face now is misuse of the anti-extremism law," says Yaroslav Sivulsky, vice chairman of Russia's Presiding Committee of Jehovah's Witnesses. "In the whole world, Jehovah's Witnesses are known as peaceful, obedient, respectful citizens. We respect government, and we are politically totally neutral." Sivulsky says the accusation of extremism is based on a false understanding of the Jehovah's Witnesses' assertion that theirs is the only true religion. Prosecutors have alleged that means they are promoting "religious discord." "And of course, it's totally wrong," Sivulsky says, "because every religion feels that they have the only true religion. This is the nature of any religion, otherwise, why are you following a false religion?" Some opponents of the Jehovah's Witnesses say their claims are more than just polite disagreement, though. "In their literature, there are some very harsh statements and very insulting statements about other faiths," says Alexander Dvorkin, a former Russian Orthodox priest who now teaches the history of religion and cult studies at St. Tikhon University in Moscow. "Of course, every religion has the right to criticize other faiths, but that should be done in a non-insulting manner, especially if you are talking about the faith of the majority." Dvorkin says that the Jehovah's Witnesses are not Christian because they don't believe in the divinity of Christ. Although they do not believe in the trinity, the Jehovah's Witnesses say they follow the teachings of Christ and consider him the leader of their church. Dvorkin regards the organization as a cult that restricts its followers' human rights, because members may not vote, run for public office or serve in the military. That, he says, means the group doesn't respect the constitution of the country and raises questions about whether it deserves legal religious status. "The court will decide," he says, "but I think from the point of view of the attorney general, those questions are quite legitimate." The Jehovah's Witnesses say that although they don't take part in political activities, they do pay taxes and obey the law. It's unclear exactly when the court will rule on the question of banning Jehovah's Witnesses throughout Russia, but an initial decision could come soon. If the court decides that the Jehovah's Witnesses should be stripped of their registration and banned, it would be illegal for them to meet or to preach from door to door. Members of the Kingdom Hall in St. Petersburg say there's no way they can obey that. Church member Nadya Belenko says her parents and grandparents were persecuted for their Jehovah's Witness beliefs during Soviet times. "It's very sad," she says, "but I'll continue to believe in God. These are conditions where our belief gets stronger, and we're going to do even more."